State Senator and Gubernatorial candidate Scott Wagner (R-York) got the approval of former advisor to President Trump Steve Bannon during a conservative event in St. Louis. According to the Associated Press, urged the crowd at the event to support Wagner’s run for Governor. 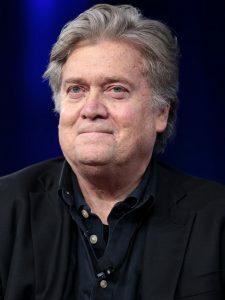 “Conservatives could start ‘taking’ the country back in Tuesday’s U.S. Senate GOP primary in Alabama — where Bannon and Trump campaigned for different candidates — and ‘when Scott Wagner runs in Pennsylvania,’ Bannon told the gathering,” the AP wrote. Wagner was a Trump supporter during the 2016 election, hosting now Vice-President Mike Pence at his recycling plant in York for a campaign rally. Update: While Bannon had kind words to day about Wagner, he did not endorse Wagner’s run for Governor. “Tomorrow in Pennsylvania the gloves are coming off and the message is, ‘the hardworking Pennsylvanians, you’re being shafted by the corruption in Harrisburg, OK? Career politicians, Democrat and Republican. But I now see firsthand serving in the Senate. … We now have a veto-proof majority, we went to 34. I watched Republican leaders giving our governor a free pass and you know what? Enough is enough,” Wagner said according to the AP. The Pennsylvania Democratic Party was quick to jump on the news, branding Wagner as an extremist. “Wagner and Bannon must have spent their private time together bonding over their anti-semitic and white nationalist views and love of Donald Trump. They likely also discussed their desire to strip health insurance from millions and to take away a woman’s right to make decisions about her own health care. Right wing Scott Wagner’s endorsement by Steve Bannon prove that he is far too extreme for Pennsylvanians,” Democratic Party Communications Director Beth Melena said. Bannon’s involvement with Trump has been questionable at best since the beginning, with Trump recently dismissing him under suspicion of leaking vital information to the media. And this is who Scott Wagner is using as an endorsement? Possibly says a lot about Wagner’s position but definitely says something about his judgement capabilities. He also has my endorsement too i mean’t scott wagner here. Goodness. Stripping women of our healthcare. That’s nice code for “abortion” and subsidized “birth control.” Really, just tell us what you mean Beth. We’re big girls, we can take it. No doubt about it, suspicions confirmed. Is this still considered a good thing? A white house cast away with an edgy super-biased news site? Ask Roy Moore if it’s a good thing. Good for the world and good for Steve Bannon completely different things. Good for Scott Wagner; smart move. All of this pro Wagner reporting from PoliticsPA, and there inability to mention Wagner had to charter Bannon’s flight to St. Louis is concerning. Time to track them money. Hope there is not any impropriety on behalf of the PoliticsPA editorial team. Bannon made the wrong choice here. Go figure, Wagz had to (PAY)charter a flight from Baltimore to St. Louis just to get the chance to talk with Bannon. The MAGA candidate for PA Is Paul Mango. Wagz has an army of skeletons in his closet that automatically disqualify him from attaining the office of Governor. Wagner thinks he can BUY this election. He Cant. Veterans of PA stand with Mango. MAGA citizens of PA stand with Mango. Wagner is an abusive, simple minded, philly backed crony, not the alternative to our pa cronies. Don’t fall for the kabuki. Mark my words, Bannon will reverse this endorsement. You’re so wrong I almost feel bad for you… first off, the fact that you think you know MAGA candidates better than Steve Bannon is laughable, and the arrogance it takes to say Bannon made the wrong decision is gross. Wagner is obviously the MAGA candidate, Mango is a complete rino. Wagner has a proven history of furthering the party. Mango is a disaffected, holier-than-thou, out of touch, loser who couldn’t excite a live wire let alone a base of voters. The only people who support pathetic Paul are the people on his payroll. When Steve Bannon and Donald Trump support opposing candidates which one is the TRUE AND RIGHTEOUS MAGA candidate? Or is there just so much MAGA everyone just can’t stop winning. Wagner is “philly-backed”? Please apologize for this incredible slight against one of America’s great cities. what’s with all the mikey regan chatter?? What di the empty fancy suit boy do?? ?